The Library offers free tech tutoring to library patrons, two days a week, with 3 50-minute session available each day (schedule below). 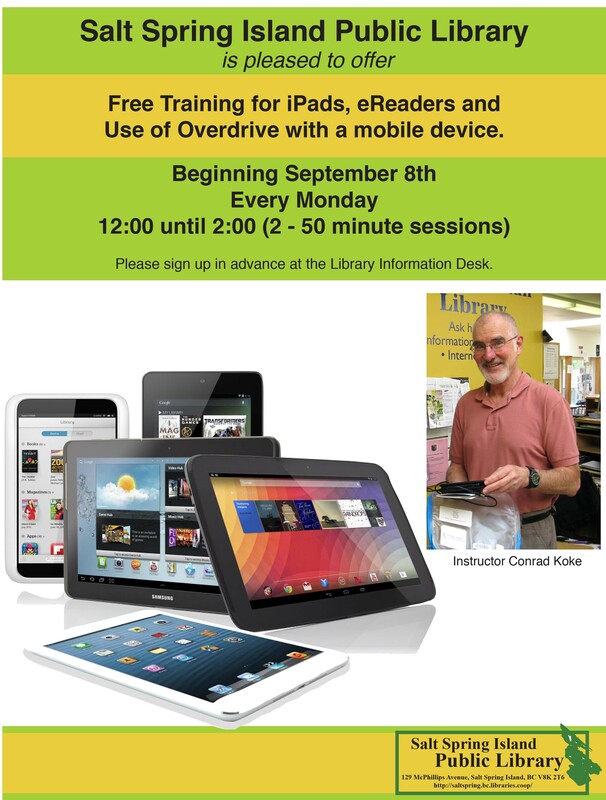 These are one-on-one sessions with a library volunteer skilled in tech issues including Windows, Mac, iPads, eReaders, Tablets, OverDrive/Libby and more. Conrad: Mondays, with tutorials scheduled at 12:00, 1:00, and 2:00 pm. Peter: Thursdays, with tutorials scheduled at 11:00 am, 12:00, and 1:00 pm. You must have a current SSIPL card to sign up for tech tutoring. You must sign up in advance for tech tutoring. You may sign up for a maximum of two tech-tutoring sessions per calendar year. 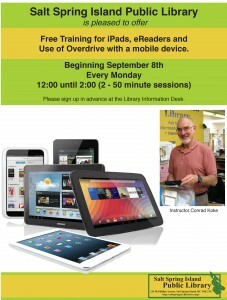 This allows more patrons to take advantage of this popular library service. You can sign up for a tech tutoring session in person at the Information Desk at the library or by calling the library at 250-537-4666. List of issues to be covered during the session. Device, e.g., laptop, tablet, e-reader, AND the correct power cable. Passwords for all email accounts. Library card and account password if you have one. Adobe ID password if you have one. Any signup and password information that allows for new Microsoft apps.